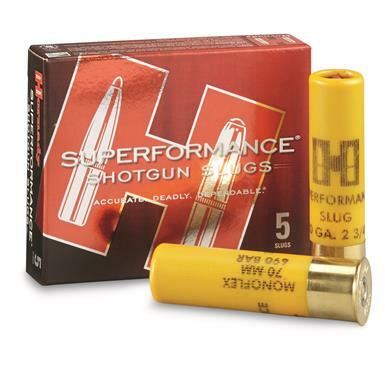 5 rounds of Hornady® Superperformance® Shotgun Slugs. Supercharge your slug gun! PRICED LOW! Specifically engineered to deliver accuracy, penetration and extremely high weight retention, Superperformance® Slugs are an outstanding choice for ALL hunters. Fueled by Hornady®'s specially-blended propellants, Superperformance Slugs are built to deliver max velocity for flatter trajectories and enhanced terminal performance. At the heart of Superperformance Slugs is the MonoFlex® - a monolithic, solid projectile made from gilding metal (95% copper / 5% zinc) and topped with the Hornady exclusive Flex Tip® feature that works as a catalyst for uniform expansion. The MonoFlex projectile won't separate, and retains 95% of its original weight. Muzzle Energy: 1,798 ft. / lbs.